What Happens to New York City’s Abandoned Cars? In a city hostile to the automobile, even the jalopies find a home. To any person who moved to New York City after 1995, abandoned cars—rusty hulks of American steel left to rot on public property—exist almost exclusively as mental set pieces for a diorama of Gritty Seventies New York, or as part of a Gothamist photo gallery. Today, in Manhattan and the tonier edges of Brooklyn—Williamsburg, Park Slope, Brooklyn Heights, Dumbo—there’s not even space to abandon a jalopy. (Chase Bank branches and bresaola-wielding specialty foods stores have displaced almost every good car-abandoning spot of yore.) 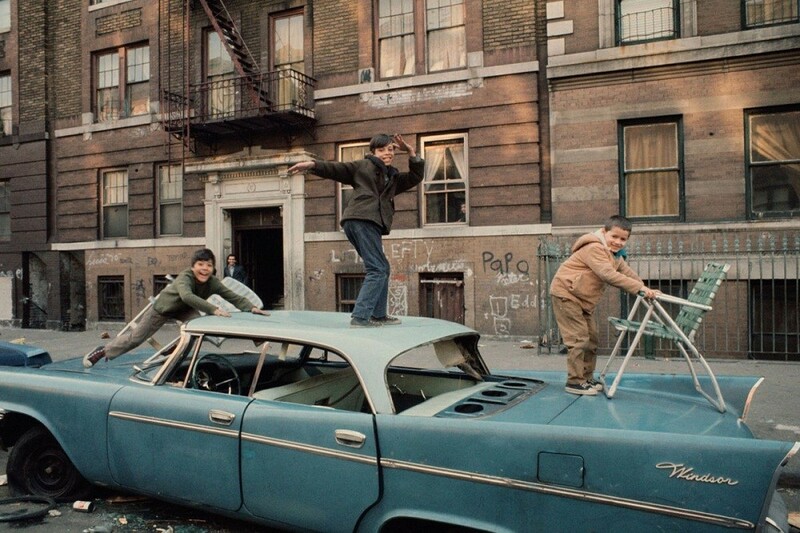 But at one point in New York’s history, abandoned cars were a legitimate scourge, each presenting a hindrance to traffic, a danger to children who would play in the wrecks, and a public eyesore. In decades when drugs suffused the city, forsaken cars were used as caches and transaction points. Better quilted velour with a roof overhead than a park bench. According to a contemporary report in The New York Times, in 1979, more than 79,000 abandoned cars were removed from the city’s streets, alleys, and overpasses. But even that wasn’t a comprehensive effort. In 1988, in an act of municipal discipline, agencies buttoned down and removed a total of 148,257 cars from city streets—an average of 406 every day. For decades, auto wreckage was such a reliable fixture of New York City streets, Volvo used a photograph of the area beneath the George Washington Bridge, rife with wreckage, to advertise its heartier, smaller cars. The idea: break the cycle of cars cheaply made, quickly bought, and soon abandoned. Nowadays they’re more rare, but they're there. Under the crumbling Brooklyn-Queens expressway, mostly, but also squatting in Brooklyn’s fast-disappearing empty waterfront lots and, sometimes, just on the street, dusty with a layer of grime and a saucing of neglect. You know, abandoned cars—the least loved automobiles in a city that generally hates the things, anyway. The city categories abandoned cars two ways, with the distinction denoting jurisdiction. If a car with license plates accrues more than three tickets, it’s towed by the NYPD and stored at one of several impound lots, accruing towing and storage fees to be paid by the owner once he’s identified. If, after 90 days, no owner has come forward, the car is put up for auction. If a car is truly abandoned—meaning no license plates or identifying features—it becomes the business of the Sanitation Department’s quaintly-named Derelict Vehicle Operations. After six hours on a city street or property, the DVO unit will tag it and remove it within three days. And where does a car go when it's removed? To a place like Ken Ben Industries, an unpaved lot and towing operation on Maspeth Avenue, in East Williamsburg. Two attendants there did not know if it was named for one man, “Ken Ben”, or, more likely, two: Ken and Ben. But even of unknown provenance and bearing a one-star Yelp Review, Ken Ben is a magnetic spot, because it sells cars for cheap—so cheap you’ll assume there’s a dead body in the trunk, or that you’ve stepped through a rift in time back to 1972, when it was feasible to get a used car for $200. While I watched, sitting on the back bumper of a beat-up Acura TL bleating its car-alarm like a stuck donkey, a 1999 Lexus GS300 in working order sold for $800, then an intact ‘98 Subaru Legacy Outback for $175. The last car I watched sell was a W126 Mercedes 560SEC, a big luxury coupe that sold in 1988 for a staggering (inflation-adjusted) price of $155,000. At auction, under the hammer of Dennis Alestra, Auctioneer? Five hundred fifty bucks, or about the cost of a 560SEC replacement bumper cover. The reason Ken Ben sells cars so cheaply is because the outfit has bought the right to auction cars in possession of the NYPD Sheriff: those abandoned, parked illegally, or repossessed by creditors. They’re sold entirely as is; as stated five times by the auctioneer, the purchaser has no legal recourse against any party involved in the sale. If there’s a lien on the car you buy and it gets repossessed? Well, that’s part of the reason the cars are such bargains. Risk always brings a discount. The process of buying an abandoned car at auction begins with “inspection.” At 9:50 AM, I walked up to the gates of Ken Ben, identifiable both by its small sign and the many cars spilling beyond the fences onto the sidewalk and street, and melted into an anxious group of people milling before two NYPD officers, who blocked the entryway, arms crossed. Sheets listing the 30 or so cars for sale—year, make, and VIN—were handed out. The final line gestured at the perpetual bounty of seized and abandoned vehicle auctions: "NEXT AUCTION TUESDAY JULY 5TH @ TOWARRIFFIC TOWING IN QUEENS." There’s no registration or flash of credentials. Buyers must be at least 18 years old and have enough cash on hand to immediately pay the purchase price, plus taxes and fees. An ID check is done at the point of sale to make sure that no one whose car has been repossessed is buying it back, which is illegal. New titles are available at the DMV. At 10 AM, the policemen stood aside, and three dozen people hustled into a bumpy dirt yard and to the right, where our lot of cars, all marked with the date, “06/21”, were parked. (Or, for some, “dumped.”) For fifteen minutes, everyone milled around the cars like they comprised a mediocre brunch buffet, pulling at trim, kicking tires, and lifting hoods like chafing dish lids, finding the mechanical equivalent of lukewarm eggs. At 10:15, through a loudspeaker, the auctioneer, Dennis Alestra, announced bidding would begin, and everyone moved into a semi-circle around the window from which he spoke, which was cut into a modified camper set in the bed of a Ford F-150—a kind of modern-day revival meeting, but with the pastor selling beat-up Subarus instead of eternal salvation. Substituted in place of the rhythmic thumping of a tambourine were the crunching, slamming sounds of a Range Rover Sport being dragged backwards by a forklift over a ditch. Auctioneers are famous for their cadences and quick delivery: One-twenty-five-can-I-get-one -thirty-one-thirty-one-thirty-aye-come-on-thirty. It creates a sense of urgency, and the staccato monotone can lull bidders into a kind of call-and-response, offer-then-bid. At Ken Ben, the auctioneer kept the speed but took a more tonal approach; at times, I identified particularly rousing bouts of the auctioneer’s delivery as using stolen bits of the melody from the dance hit, Macarena. It worked. Even after an auction seemed to have reached its natural end, its final value, a targeted stream of numbers and encouragement—aye-nine-hundred-gimme-nine-nine-nine-nine-nine-hundred—always seemed to eke out an extra hundred dollars for the towing yard. Or an extra $20 for the auctioneer. And that’s the end of the line for many an abandoned car—at least those in salable shape. Purchased, refurbished, and put back on the road. That is, until an owner’s money, patience, or luck runs out and the car is left on the street, to be scooped up by the Department of Sanitation and sold once again. Folks in Texas and Pennsylvania, however, are a little more wary. A man tossed a dummy bomb into a police van, then barricaded himself in a Chrysler Aspen.